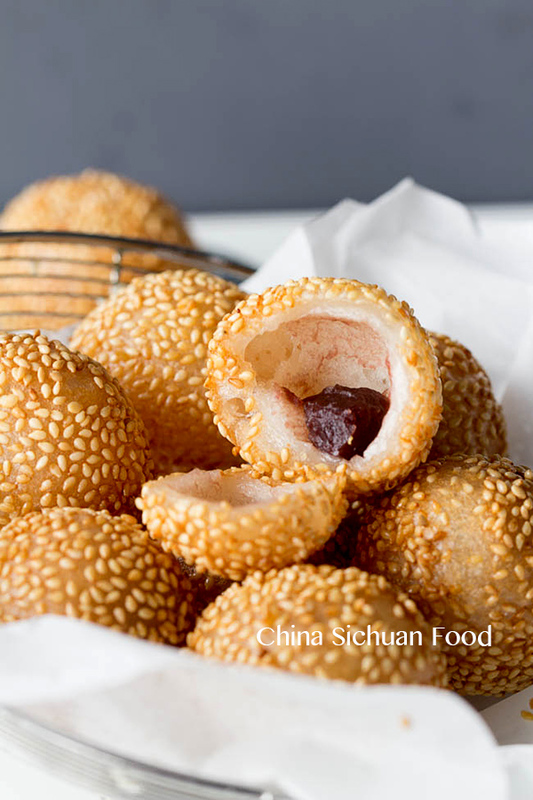 Famous dim sum fried sesame balls with glutinous rice flour and red bean paste; Also known as Jian Dui in Chinese. Let me guess, have you ever tried those fried sesame balls in dim sum halls? Possibly yes! 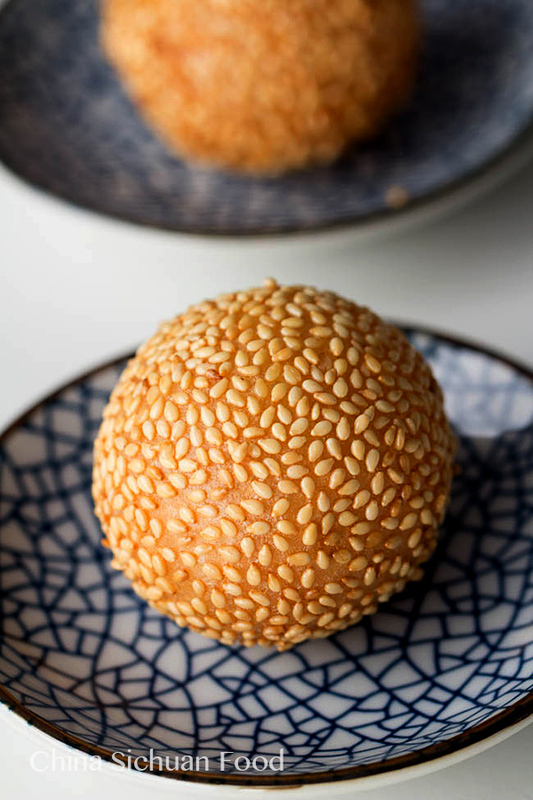 Those sesame balls usually are served to enjoy between savory dim sum dishes with various sizes. 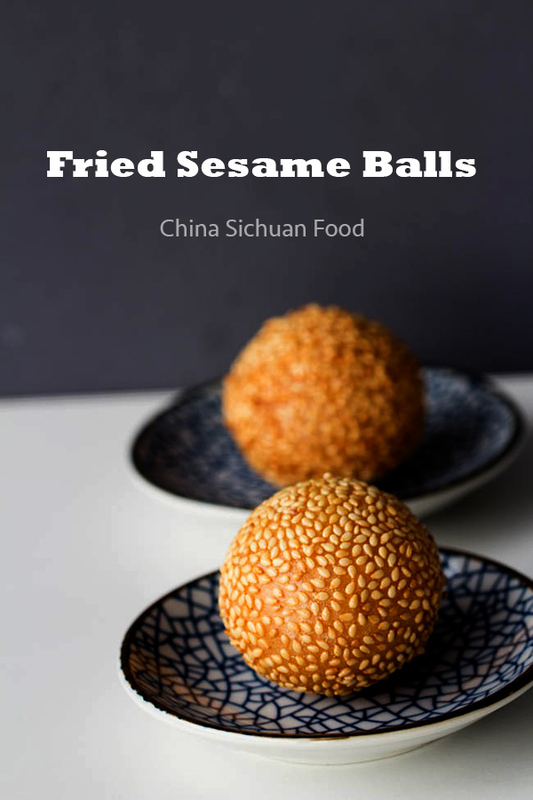 In fact, sesame ball is a very common breakfast dish popular far beyond Guangdong cuisine (cause the popularity). It gets several nicknames in Chinese—Jian Dui or Ma Tuan. We usually have this as breakfast during my high school time. Then more and more popular healthy ideas come into life, so we did not cook it frequently in following years. However when it comes to holiday, a small batch of sesame balls will bring almost every guest back to old memories. I feel it is necessary to record how to make this fried sesame balls at home. It is a tradition to make some dishes with glutinous rice (sweet sticky rice) for Chinese people. For example we have Chinese rice dumplings (Zongzi) for Dragon Boat Festival,Chinese tteok for Middle Autumn day, sesame rice dumpling for Lantern Festival and NianGao for Spring Festival. 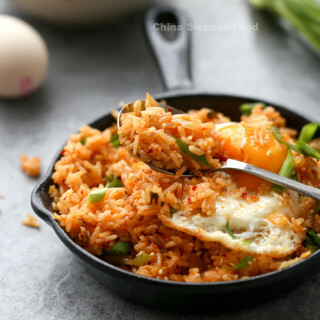 Glutinous rice is gluten free rice with lower production relatively in China. 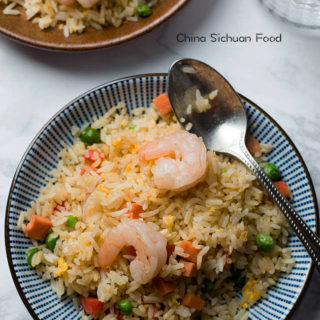 Chinese people treasure the healthy value of sticky rice and thus providing various yummy dishes not only for holidays, but also daily desserts and breakfast- like glutinous rice balls with coconut, mixed congee and glutinous rice balls with crushed peanuts. 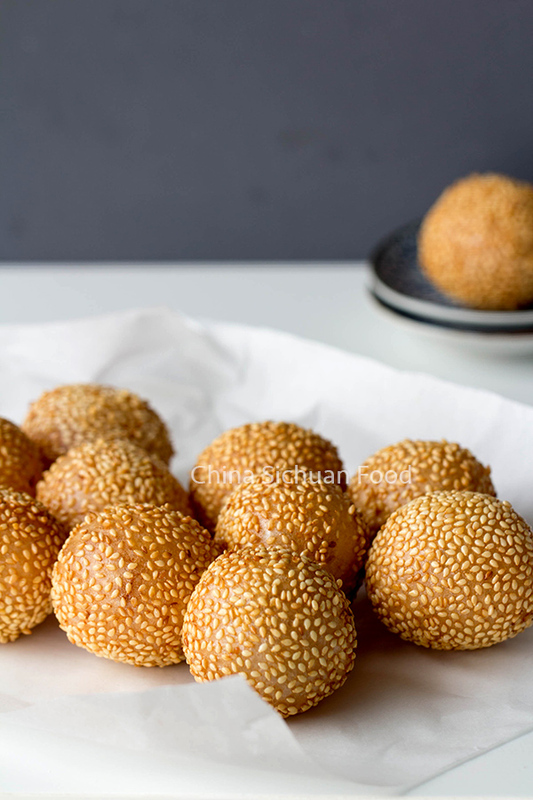 Have you ever tried to make those sesame balls at home? And succeeded? Haha, I guess some of you guys might have tried, but ended with frustration. To make the perfect sesame balls, here are some tips Elaine would love to share publicly. About the glutinous rice flour: water milling is a traditional processing technique used in many Asian countries. We used to water mill the soaked glutinous rice at home with a stone mill in the back yard. Water milled glutinous rice flour usually has fine texture. So firstly you will need water milled glutinous rice flour. About how much water: the ratio between the flour and water should be between 5:2 or 2:1. If too much water added, the balls will collapse completely after deep-frying. If too little water added, the shaping process will be quite difficult and the balls may explode during deep-frying process. About how much sugar: the restaurant version usually calls for a ratio of 5:2 (flour: sugar). I know people are matching their sugar intake each day. We can only slightly reduce the amount of sugar for home made version. The lack of sugar will not only influence the taste, but also the golden brown color. How to avoid explosion during the deep-frying process: You may have this experience: you made perfect balls with red bean filling, check the oil temperature very well but still you get the balls explode and oil sprinkle almost everywhere in your kitchen. The key skill here is to boil around 1/10 of your flour firstly and then mix with the remaining flour. When glutinous rice flour meet heat or hot water, it becomes sticky, which can prevent explosion in deep-frying process if the oil temperature is well controlled. Then next question: how to control the oil temperature? If you get a kitchen thermometer, heat the oil around 120 degree C. But relax if you do not have one. Just throw a smaller glutinous ball into the oil, start deep-frying when you will see lots of small bubble around. I would strongly suggest watching the video as I instructed lots of details about how to deep-fry the sesame balls. Higher oil temperature will burn the surface while the inner side keeps uncooked. However lower oil temperature cannot bring you a perfect golden brown color. When to stop fire —I would suggest transferring the balls out when they are slightly golden brown or medially golden brown because the left heat will darken the color in following minutes. We call this as “后油” effect in Chinese, literally mean after deep-frying effect. Here is the video and click like please if it gives some inspiration to you. And do not forget to subscribe my youtube channel since I will create more video recipes in the year of 2015. Only if you guys like video of course. Famous dim sum fried sesame balls made with glutinous rice flour and filled with red bean paste; Also known as Jian Dui in Chinese. In a small bowl, take around 2 tablespoon of glutinous rice flour out and mix with around 10ml water. Knead to until smooth. Bring some water to boil and then cook the small dough for around 2 to 3 minutes. Prepare a bowl with cold water on the side. Then the small dough is ready, transfer out and soak with cold water to cool down. In a large bowl, mix the left flour with sugar and baking powder. And then add the small dough in. 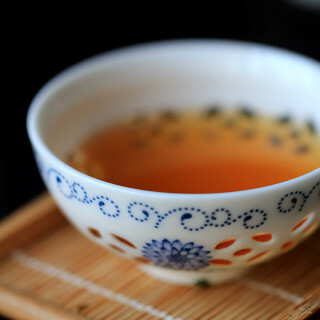 Break with hand and slowly stir in water. Continue kneading until smooth dough. Further shape the dough into long log and then divide into 20 equal portions. Shape each portion into a round ball. Prepare two bowls: one with clean water and the other with sesame. Take one ball with one hand, quick dip with water and then roll the ball in sesame bowl with another hand. This is a personal tip to make the process easier. Press the balls several times so the sesame seeds can sticky to the surface. Repeat to finish all the sesame balls. Heat enough oil (at lest cover the balls) until 120 degree C (or you can test the temperature with a smaller ball). Carefully add the sesame balls, slow your fire immediately and slowly deep-fry the balls until slightly golden brown. Turn off fire; transfer out and absorb extra oil with paper. Cool down for several minutes and enjoy! For larger batches, re-frying before serving. This is great!! Everyone in my family loves sesame balls.We always get it when we go to Chinatown, but I have always wanted to attempt it at home. Thanks for sharing the recipe and tips! Pinning. Thank You Thao for your sweet comment. We made this for celebrating the new year of 2015. And glad to know you like fried sesame balls too. Thank you!!! These bring back such amazing memories. I used to work in a complex with a highly rated Chinese restaurant. The Owner promised me he would teach me to make a few of my favorite regional dishes, including his version of these with black sesame filling. But I had to move suddenly. 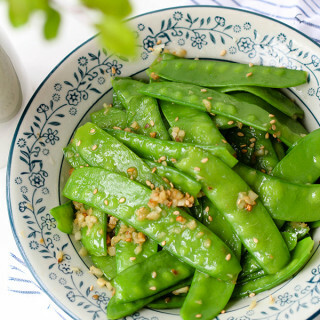 Now with this recipe and the sesame filling from another of your posts I can make these way to often than is good for me! Yeah! Fried sesame balls with black sesame filling is also excellent! Glad you like it. Happy cooking ahead. My pleasure Thalia! Happy cooking ahead. Thanks for the sweet comment. 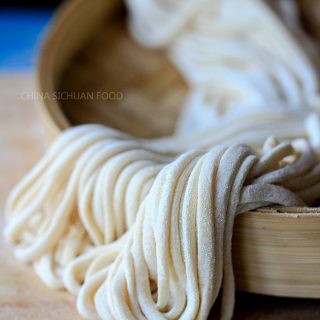 This is my favorite bites between savory dim sum dishes too. Try it at home and I believe you will love it the same as me. These balls look stunning. I have never ever before eaten these or heard their name but I must say I am so inclined to make these! Thanks! Go ahead and try it. You will love it the same as me. 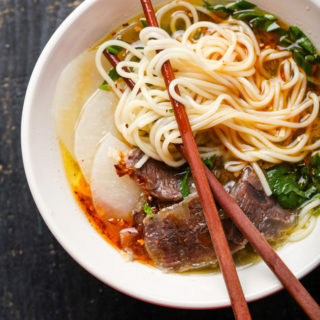 As a traditional food, it really wins a long time popularity. Me too! Glad to know you like it. I have been looking for a Sesame Ball recipe for years. This is one of my favorite desserts. Will definitely give this a try. Thanks for sharing. You are welcome Sonia. 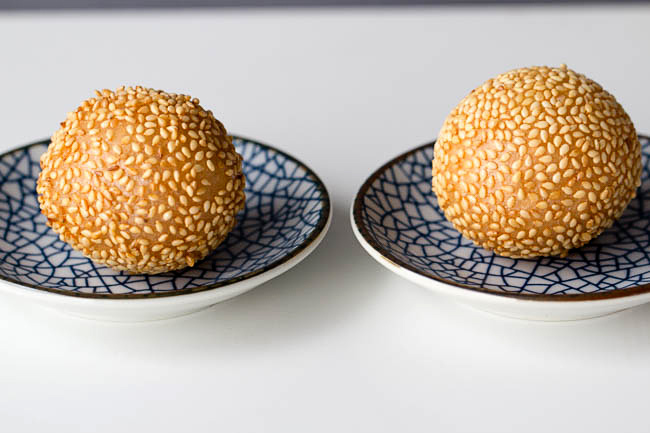 Sesame balls are really worth trying. Go ahead and try it. So Yummy! I have never eaten anything like it in my life (or worked with glutinous rice floor for that matter) so I was pretty exited with how they would taste. Me and my husband think this recipe is amazingly delicious! 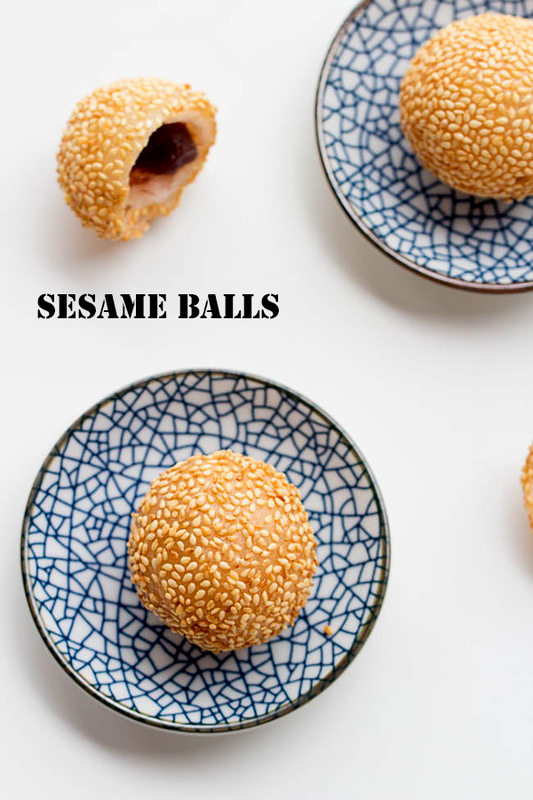 These sesame balls are so tasty and easy to assemble that we will eat them often from now on; I’ll need to try poppy seed filling and your black sesame filling soon. Thanks once again for the great instruction and tipps, the video was very helpfull too! Thanks so much for the feedback. I love love this sesame balls very much! 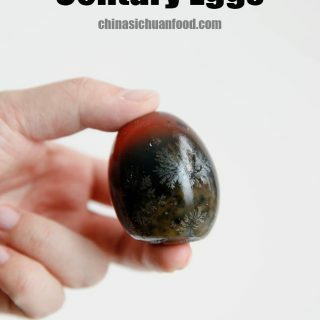 It has been quite popular in China as a breakfast or food for celebration for quite a long time. Glad to know that you guys love it too. Go ahead and explore different fillings. I tried the recipe, and I have one problem. That is my sesame seed fall off when frying. What did I do wrong? I did press the sesame seeds and make sure it stick to the dough before I fry. It is really important to roll the ball in water to hold the sesame seeds. And after that, press the dough several times with the two palms. Some of the sesame seeds might fall off but you will still get enough on the surface. Oh my God, I love these jian dui, but I always make mine with lotus paste in the middle! this recipe helped my a lot. Xie Xie. Looks absolutely delicious! One of my favorite snacks. Hi, I was thinking of shipping these to a friend of mine for her birthday- where she lives she can’t find any red bean cans. How long do these sesame balls stay good while unrefrigerated (so i can know how fast I have to deliver it) and how long do they last when put in the refrigerator usually? That’s a really love idea. 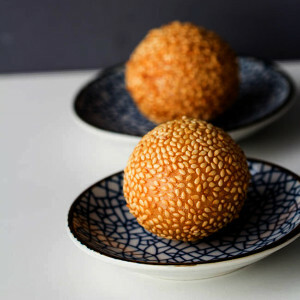 Perfect round sesame balls for a birthday. However it is quite difficult to operate as the sesame balls become sticky and not crunchy at all when cooled down. So it depends how far you need to deliver. I’m using an extra fast usps shipping so the Jian dui will get there in abt a day and maybe 6-7 hours. No, then it cannot work. I am so sorry. Wow! I’m finally able to enjoy these at home without having to drive hundreds of miles to a Chinese bakery! I just made them and we’ve eaten half already – still warm, couldn’t help ourselves. Gave a few to our Indonesian friends and their smiles told me I did a good job. The only issue I had was the dough, I had to add a lot more water than the recipe called for to get it to hold together. Thanks for posting the recipe in English and the video too, very helpful!!! Thank you for the wonderful comment. You really did a good job. It tastes so great when still warm and can be one of my favorite snack and breakfast. Happy cooking! Hi, Elaine! These are so beautiful and delicious, but I’m wondering if you can explain why you do the “small dough” part? Why cook a little bit of the dough first? 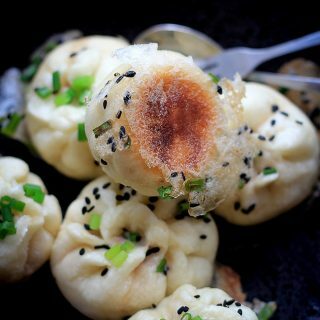 I usually cook one small portion of the dough, this can help to hold the sesame balls and reduce the chance of explosion during deep frying because of the gelatinization. If you cannot control the fire appropriately，the balls usually expand very quickly, which might lead to an explosion. I think you can also freeze the sesame balls before cooking. That way, the sesame ball won’t explode and it still cooks thoroughly. Thanks for the great suggestion, Lzzy! After 2 weeks of searching for the Authentic Glutinous Rice Flour here in Manila, Philippines… Finally I was able to accomplish my experiment on Sesame Balls – Jian Dui. I must admit that there are a lot of versions including Filipino Version called “Buchi”, I really want to follow your recipe to the T.
Worth the wait to find the said Flour. You are very precise in giving out instructions both written and video. 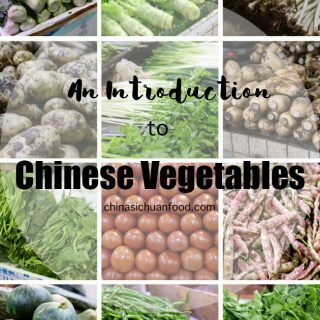 There are a lot of recipe which I would like to do for the Chinese New Year, my only problem is where to find all the ingredients shown. If you happen to know any dealer or Distributor in the Philippines, please let me know. Thank you for being precise and truthful in your instructions. Thanks for trying my recipe and let me know the result. This is almost the perfect version for me. I have failed several times before having the access to my ideal sesame balls. I do not know sticky rice flour is so hard to find in Philippines. It is a very common ingredient in China. How about sticky rice? It is popular in Philippines? I made these twice this week and they are delicious; however, mine are not expanding at all. The flour looks more bread like than chewy mochi. Any suggests? It might be the oil temperature (usually too high) or you did not soak the balls in the oil. Next time, slightly change your oil temperature and press the balls down after floating. Is 120 c hot enough? It’s equal to about 250 f and I’ve seen other recipies go up to 330f. Tried making them myself, and 250f just kinda made them soggy. 120 degree C is hot enough. The frying process should take minutes with a lower oil temperature than other fried dishes. Elaine – Is it possible to freeze the sesame balls to be fried at a later time? Sure, you can freeze them and re-fry before next serving. I’m just about to make these for a friend’s gathering (very excited btw!) & I was wondering if you can recommend a dipping sauce. I recently discovered these when I tried Dim Sum for the first time and they were served with a dipping sauce but I unfortunately couldn’t get the name. Usually, we do not need dipping sauce for sesame balls. They are good enough along. 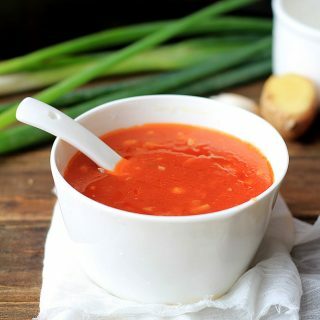 However if you really want to serve with a dipping sauce, you can use sweet and sour sauce or sweet and hot sauce. Hello! I would like to try to make these but can you convert the measurements from ml to cups or teaspoons? Thank you!! These are seriously good. 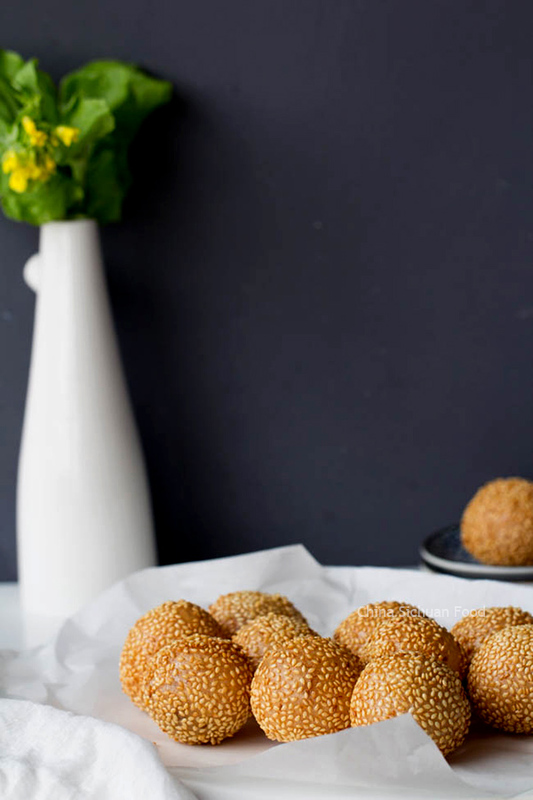 I have loved these sesame balls for many years, and now I can make them myself. Thank you for such clear instructions. It will definitely not be the last time I make them! I’m afraid they are too good, already I have eaten too many. Enjoying your balls Katie. Thanks so much for this wonderful feedback. Thanks for the recipe. How do you recommend storing left overs? Inside the fridge or keep outside in room temp? I usually keep them in room temperature and re-fried before next serving. These are wonderful! I would like to try them with poppy seed filling. Do you have a recipe for poppy seed filling? All the ones online are European and just don’t seem like the kind I have eaten in Chinese restaurants. I am sorry I do not have a coconut filling recipe right now. If I want to freeze them, do I cook them first and then refry them when ready? Or should I freeze them uncooked? Can I freeze uncooked dough? I do not think freeze uncooked dough is a good idea. But I have not tested yet. I suggest you frying the sesame balls until half cooked (shape well formed but quite pale in color). And then re-fry them for a short time before serving. Great thank you! Also, would it be possible to make the dough a few hours beforehand before making the sesame balls and frying them? Sure. Just cover well and avoid from drying out.